﻿ National Small Business Week Celebrates the American Entrepreneurial Spirit » Red Mango Marketing! What creates two out of three net new American jobs; produces close to half of our nation’s goods and services (nonfarm private GDP); and can be found, coast to coast, in every small town, big city, and rural enclave? The 28 million small businesses that propel our economy forward and define our national entrepreneurial spirit. To be American is to have the freedom to innovate, take risks, create, transform and put in the hard work that has led to the successes — and failures — that define human progress. From May 1-7, the U.S. Small Business Administration (SBA) will recognize and honor the critical and life-altering contributions of America’s moms and pops, manufacturing enterprises, Main Street retailers, and entrepreneurs during National Small Business Week. Every year since 1963, the President of the United States has issued a proclamation setting aside one week to “recommit to advancing these vital enterprises, and celebrate their contributions to our collective American story.” As Federal Reserve Chair Janet Yellen said, it was small businesses that powered our recovery after the Great Recession. This year’s National Small Business Week, themed “SBA: Dream Big, Start Small,” will include special events in Atlanta, New York, Denver, Phoenix, San Jose, Oakland and Washington, D.C. Tune in all week for live-streaming, beginning at 7:30 p.m. ET Sunday as we officially kick off the week and join me at @MCS4Biz on Twitter or Instagram, and #DreamSmallBiz. America is one of the few countries that gives entrepreneurs a seat at the President’s cabinet table. This allows the SBA to provide an amplified voice for small businesses and represent their divergent interests. The SBA also offers an extensive national network of small business lenders and counselors that is unmatched anywhere in the world. Many innovators with great ideas and great potential do not begin with great wealth, so they need a great government partner to support their success. The SBA offers the “three Cs” to help aspiring entrepreneurs start up and scale up by making counseling available, providing more choices and chances to secure capital, and by helping them seize market opportunities to commercialize their ideas. These risk-takers will help make our lives more productive, safer, healthier, and benefit society overall. Capital: SBA fills gaps in the commercial lending marketplace so success in the small business sector is based on merit, not family wealth. To inquire about a small business loan, click here. Counseling: SBA provides free consultation and advice to help Main Street succeed. To find a counseling center near you, click here. This year, during National Small Business Week, we recommit ourselves to those fearless entrepreneurs who plan well, work hard, and dream big. Every business starts small. Many of today’s most recognized brands were once small businesses until they found an SBA counselor, lender or investor. I came to this country as a 5-year old immigrant who didn’t speak a word of English. Today, I serve in the cabinet of the President of the United States. My story is possible only because of America’s promise and its entrepreneurial spirit. I’m proud to lead an incredibly talented team assembled from across the country ready to serve you. Success in business comes one small step at a time. So dream big, take that next small step today, because the next great American success story could be staring back at you in the mirror. About the Author: SBA Administrator Maria Contreras-Sweet started three businesses in Los Angeles, including a community bank, before joining President Obama’s cabinet in April 2014. 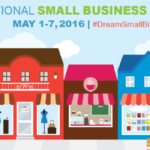 The post National Small Business Week Celebrates the American Entrepreneurial Spirit appeared first on Constant Contact Blogs. This entry was posted on Friday, April 29th, 2016 at 9:00 am	and is filed under Fresh Insights, News, News & Updates, Small business tips. You can follow any responses to this entry through the RSS 2.0 feed. Both comments and pings are currently closed.